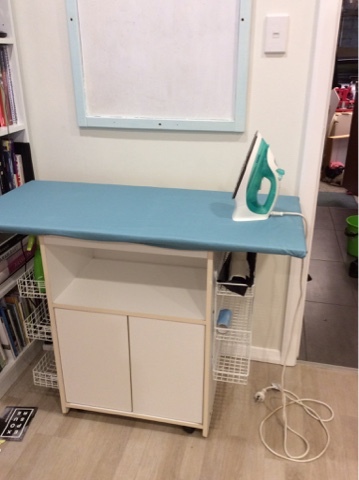 I've started to notice that quite a few quilters are making themselves a larger ironing surface either by adapting their ironing boards or putting a larger top on a bookcase. 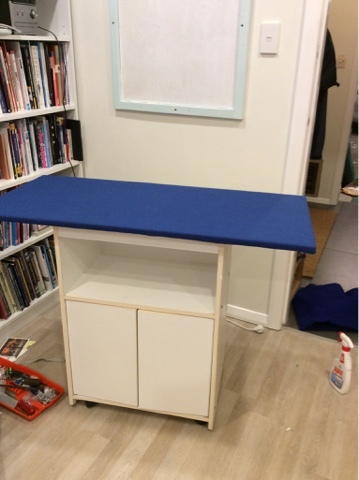 I had a small cupboard that can be rolled around on castors, it's 45x60cm. It used to be my mother's microwave cupboard. I had a board cut to size at the hardware shop, I wanted it to fit into a space 110cm long when I'm not using it. 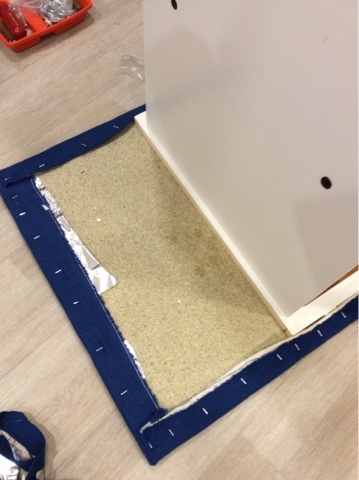 I attached the board to the cupboard with screws, countersinking them so they wouldn't affect the ironing surface. 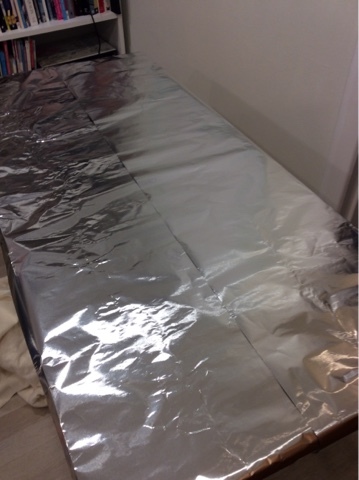 I covered it wth two layers of tin foil. I'm not sure if that was necessary but it should help the board to resist steam from the iron and might help stop it getting too hot. Then I added a layer of cotton batting but it was a bit bumpy so I added a layer of wool coat fabric on top. I turned it upside down to staple down the padding. Then I covered it with some blue cotton drill that I had in the cupboard. I might order some of the ironing board cloth from Amazon but this should do in the meantime. I only safety pinned it on, so I can remove it easily. Then I noticed all the wasted space under each end and used some racks which we had in the garage left over from a previous project. They hold all the ironing paraphernalia. 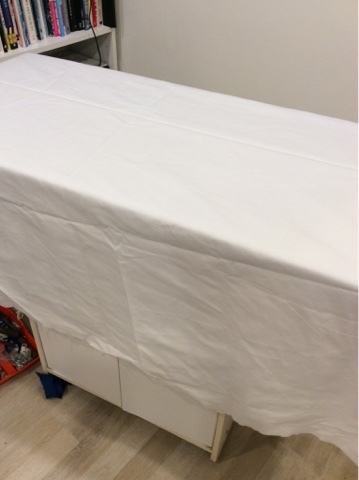 The baking paper, Teflon sheet, spray bottle, fluff remover roller. 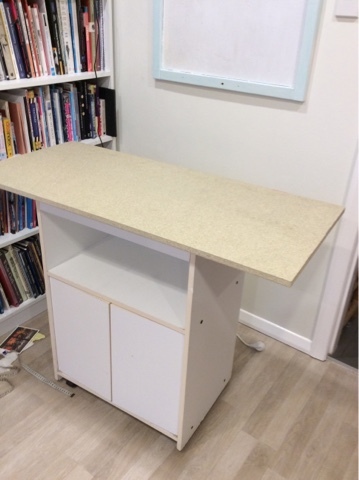 So now I have a mobile ironing station in my new studio and I love it. 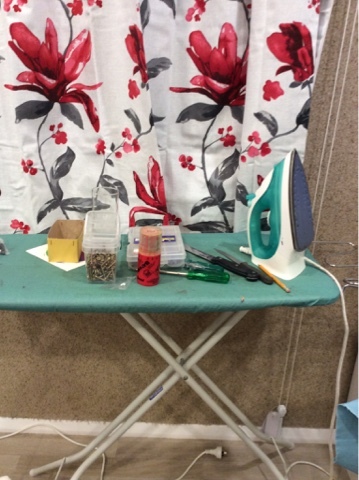 The turquoise fabric needed to be ironed before I covered the padding, but my ironing board was covered with tools and nails, then it occurred to me - DING- I could use my new ironing board.